Today I’ve gone ahead and updated our Nintendo Power Archive collection adding two new magazines with all the Zelda references that there are. We now have the first 8 issues available in our Zelda Publications area of the site. 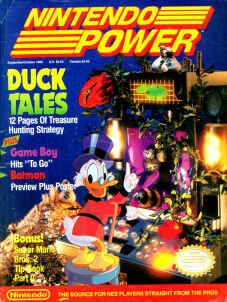 The first 8 issues of Nintendo Power each had some Zelda references with at least 7 of them having specific material dedicated to the games in the form of secrets revealed, strategy guides, a comic strip, etc… If you’re an old school gamer like myself, it really has a nostalgic feel to it when you glimpse through these old magazines. –The Adventure of Link has a tip about walking through walls in the Great Palace, found in the Classified Information section. –The Legend of Zelda also has tip in the Classified Information section about leaving one enemy alive in the overworld to avoid enemy respawns. –Listing of all six 1-up’s found in the Adventure of Link. –A question about how to get the hammer in The Adventure of Link is answered in the Counselor’s Corner. –A secret tip in the Classified Information section about how to avoid monster scenes in the Adventure of Link. –The Adventure of Link reaches #1 on the Nintendo Power Top 30 while the Legend of Zelda sits at #4. We will be adding these on a relatively frequent basis over the next couple months. If you really enjoyed these, let us know by posting in the comments below. Also, remember you can make individual comments about the images with the image gallery.